A second woman has finished a solo trek to the South Pole, three days after another British woman set a new 42-day record for the 700-mile trip. Rosie Stancer, 43, from Barnes, south west London, is the third woman to complete the trek - the first was a Norwegian in 1994. The women had flown to Antarctica on the same plane and both set off on 30 November from Hercules Inlet. Mrs Stancer had been raising cash for the Special Olympics. She succeeded in her bid to break the previous record of 45 days by arriving at the Pole shortly after 1600 GMT on Tuesday - 43 days and 20 hours. But Fiona Thornewill, 37, broke the old record on Saturday by reaching the pole in 42 days. 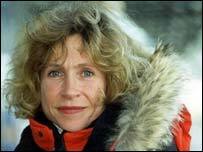 Mrs Stancer has already conquered the North and South Poles in unsupported all-woman expeditions. Her spokesman, Julian Mills, said "her response was typical of her" when he gave her news of Mrs Thornewill's achievement . "She asked me to forward her best wishes and congratulations to Fiona," he said. "And to let her know that she was fast approaching the Pole and was looking forward to joining her there and helping to put the British flag back at the top of the world of polar exploration."